Approximately $1 billion worth of energy goes into the US pharmaceutical industry every year. This monstrous energy consumption has a direct impact on product quality and consequently profitability in the business. Major pharmaceutical companies are particularly under immense pressure to reduce production costs while maintaining a sustainable level of product quality. Investors can counter this challenge by investing in energy efficiency solutions. The current manufacturing environment benefits from energy efficiency investments in not only profitability, but also in furthering the environmental strategy. In the context of solutions from ARANER, the question is about how thermal units can reduce energy consumption in pharmaceutics. The financial performance of pharmaceutics is an area of concern following the competitive nature of the industry. As a result, the price-energy relationship has offered players an area of reducing production costs-energy efficiency. Investing in energy efficient practices and technologies has been gathering heat in recent years as the benefits are manifold. Apart from reducing production costs, this approach is rewarding in terms of enhanced production and improved product quality. In the current enthusiasm about environmental conservation, reduction of energy consumption can also be a key policy in pharmaceutics. Different ways of energy efficiency/conservation exist, but it is upon management to adopt the most relevant one. Approaches range from those aimed at changing human behavior to those that affect design or configuration of equipment. ARANER proposes a highly successful energy efficiency approach called Thermal Unit, or Thermal Energy Storage (TES). High cooling loads and critical facilities are normally inseparable. Pharmaceutical manufacturers, like intelligence agencies, data centers and government labs, need energy densities that can support high cooling demands and loads. Even a short-lived loss of power loss that disrupts cooling for few minutes is enough to distort sensitive pharmaceutical processes. This could in turn cost the facility millions in losses. These momentary losses as well as planned maintenances are best-countered using thermal unit technology. However, the main reason a pharmaceutical company needs TES is to shift the cooling load. Using the more affordable off-peak energy and reducing on-peak demand costs can go a long way in cutting operating costs. The system reduces energy costs in the industry by avoiding costly peak daytime energy, instead drawing from off-peak electricity at night. Studies show that this shift of the cooling load can achieve as much as 50% reduction in the cooling bill. An advanced TES system smoothens out the peaks in daily load profile, thereby reducing chiller load. Consequently, this minimizes the refrigerant charge size and chiller maintenance costs. ARANER can design the TES system to offer either partial storage or full storage, which is the amount of load directed to off-peak periods. Partial storage is a strategy whereby the chiller runs nearly constantly for 24 hours, the aim being to reduce a section of the peak load. During the night, the chiller’s cooling output will exceed the facility’s cooling load in most cases. The excess cooling is stored in a TES tank. As the facility load increases during the day, the stored energy is used for cooling. This strategy is referred to as load leveling. In full load shift strategy, the chiller runs at high output throughout the off-peak hours and its energy is stored. When daytime comes and utility prices rise, the chiller is switched off. Cooling of the pharmaceutical processes does not stop because the cold is drawn from the TES tank. The good thing with thermal unit from ARANER is that it also comes with a control and monitoring system for optimum energy efficiency and performance. This enables pharmaceutics to not only minimize energy use, but also reduce emissions. 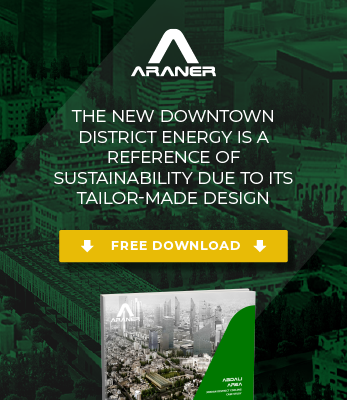 ARANER compares a thermal unit to “a battery storing energy for a facility’s air conditioning needs”. Chilled water based storage has grown in popularity because it has helped many pharmaceutical companies reduce their monthly electric bills. In the current world of scarce energy resources, an industry that consumes over a billion dollars in energy must find ways of eliminating wastage. For pharmaceutics, thermal units offer a cost effective and sustainable avenue for reducing peak electrical demand costs. How are you taking advantage of this technology?